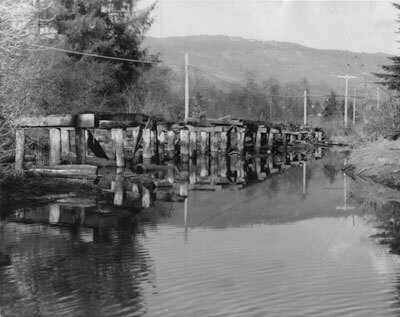 View of former Pacific Great Eastern Railway bridge across Ambleside Slough.Original photographers note: The Pacific Great Eastern Railway once crossed the slough at Ambleside in West Vancouver on this old timber bridge. These remains show what damage a short twenty years of disuse can effect. Scanned August 2011 using Epson Perfection V700 Photo at 300dpi and 100% of original image size. Alternate Versions: Lossless TIF from original scan at 300dpi and 100% of original slide. W24 x H19 cm black & white print on photo paper.